The Aegidienberger is a small gaited riding horse from Germany. Like the Icelandic horse, it can naturally perform a gait known as the tölt. They were developed in Aegidienberg and first recognized as a breed in 1994. 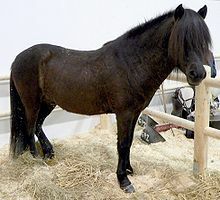 The Aegidienberger is a cross between the Peruvian Paso and the Icelandic horse, created to produce a horse that was larger than the Icelandic, but still small and hardy enough to navigate difficult terrain. They generally stand between 13 and 15 hands high. All colors are permitted for this breed. There have never been more than 100 members of this breed at any one time, and the breed numbers have been in decline since the inception of the stud book. The first generation, generation F1, was born after crossbreeding a pure Peruvian Paso stallion with a pure Icelandic mare. The F1 generation was than crossbred with a pure Icelandic horse, this resulted in the R1 generation. Finally the generations F1 and R1 were crossed and the modern Aegidienberger was born: a 5/8 crossbreed between Icelandic horse and Peruvian Paso, with 5/8 Icelandic blood and 3/8 Peruvian blood. ^ a b . Accessed 12/2/17. ^ "Aegidienberger/Germany"[permanent dead link] DAD-IS. Accessed 5/5/08.